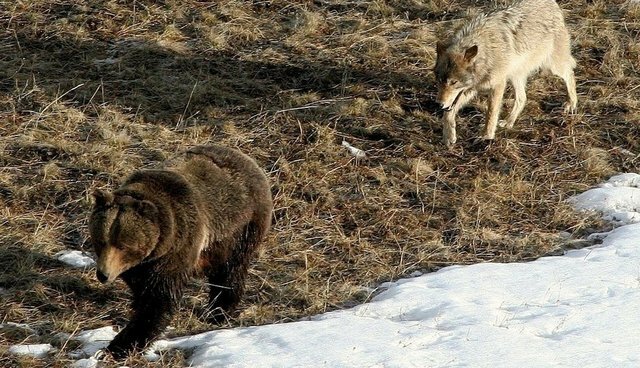 Will Grizzlies Be Treated Like Wolves and Bison? The first grizzly visible from Yellowstone's roadside recently appeared. He walked straight to the partially thawed Blacktail Pond, reached in, and dragged out the remains of a bison. He's a smart bear: Earlier in most winters, a bison will walk onto this snow-covered pond and crash through thin ice. Unable to escape, the bison drowns; the carcass freezes. The pond becomes a meat locker for emerging grizzlies. Hoping to see the bear, Mary and I left home well before daylight and drove to a pullout near the pond. In luck, we spotted him as he awoke from a night's rest atop the carcass. For the next three hours, we enjoyed watching him eat, sleep, play with his toes, and intimidate hungry ravens and coyotes. While observing, I fretted about the US Fish and Wildlife Service's (FWS) plan to delist from the protection of the Endangered Species Act all grizzlies in the Greater Yellowstone Ecosystem. Scientists and conservation organizations question the plan; I dread it. I don't want to see bears-like this one delighting in his first meal in months-at the mercy of Montana, Wyoming, and Idaho. The governor, legislators, and fish and game department of each state have shown that to them management means killing. Look at how they have wasted two other Yellowstone icons. Each winter, hungry bison migrate from Yellowstone's snowy interior to its northern border where less snow falls. This winter up to 900 of those migrators will be killed because Montana's Department of Livestock fears bison will pass brucellosis to cattle-though this has never happened. Hunters will shoot at least 400 as soon as they step hoof outside the park. Up to 500 more will be captured inside Yellowstone by the National Park Service and trucked to slaughter. Our nation's last genetically pure bison are dying to appease Montana's Department of Livestock. And then there are wolves. Thousands of these essential predators have been killed in Montana and Idaho since delisting in 2011. So many were killed in Wyoming after delisting that FWS brought them back under ESA protection. But If politicians have their way, more will die in Wyoming as well as Minnesota, Michigan, and Wisconsin. If their bill becomes law, it will again delist wolves in those states from ESA protection and block concerned citizens from challenging the delisting in court. Conniving politicians aim to cut out judicial review, checks and balances be damned. Given the slaughter of bison and wolves, I have no doubt that unprotected grizzlies-maybe even the one we are watching-will die as cash-strapped fish and game departments rush to bring in fees from trophy hunts. The FWS will just watch it happen. You only have to look at Idaho's brazen killing of wolves to understand that all the agency actually requires is an annual report and preserving at least fifteen breeding pairs. Other than that, Idaho can do as it pleases. That includes spending $2,000,000 over five years to eradicate wolves after the FWS spent millions more to build the population. The US Fish and Wildlife Service must know that delisting is a death sentence for hundreds of the very grizzlies they have worked so hard to recover. Yet that's what they're proposing. Surely, moving straight from recovery to death cannot be the intent of the Endangered Species Act. Can it? Rick Lamplugh lives near Yellowstone's north gate and is the author of the Amazon Bestseller In the Temple of Wolves: A Winter's Immersion in Wild Yellowstone. Available as eBook or paperback. Or as a signed copy from the author.